Jonathan Newell talks to engineering design company Newtecnic about analysing vibration in a new 356 metre high television tower in Turkey. UK building engineering design company, Newtecnic, believes in taking things to extremes and that’s exactly what the company achieved with its innovative modular façade system for Turkey’s latest showcase architectural project, the 356m tall Küçük Çamlıca TV (KCTV) Tower in Istanbul. Set to be an iconic landmark, when complete the £36 million KCTV tower will clean up the Istanbul skyline by incorporating over 100 broadcasting transmitters, many of which are polluting the existing scenery as unsightly steel masts. 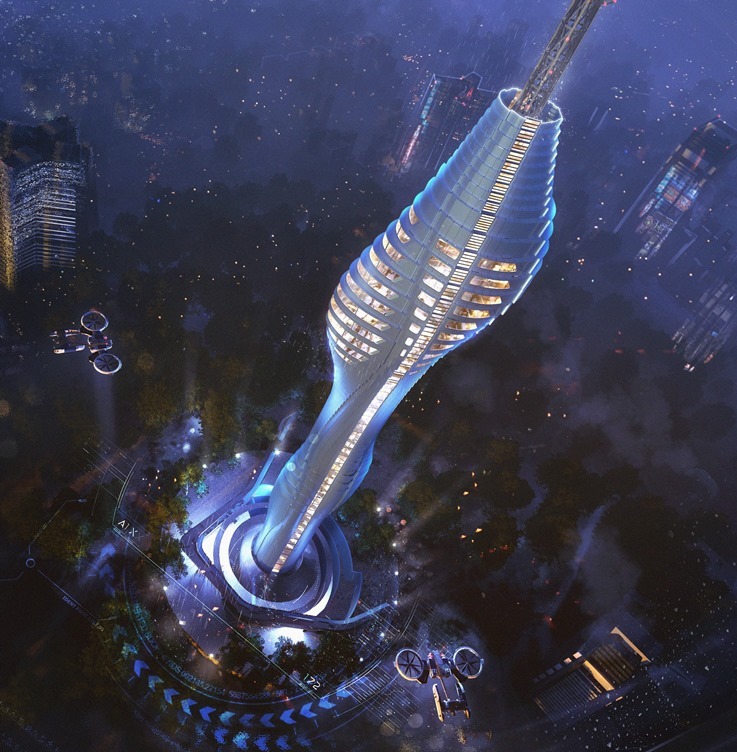 The tower is expected to attract 4.5 million visitors a year and incorporates restaurants, exhibition and meeting spaces, two high level observation decks and a panoramic elevator. Such an important and innovative structure required careful attention to every detail from the very start and Newtecnic applied its innovation methodology of using academic peer reviews, advanced CFD software for airflow analysis and the latest 3D printing technology for prototyping to developing a façade concept that would enable inhabitable spaces to be created along the whole length of the tower core rather than at the top. To find out more about Newtecnic’s role in the tower design and the tools they use to assure the safety of such a structure, I spoke to CEO Andrew Watts and the company’s Chief Associate Engineer, Rosen Kunchev. According to Watts, towers of such height usually only have accommodation at the top because of the complexity and the building costs. “Using specially developed algorithms, we devised a design that allows lightweight pre-fabricated glass reinforced concrete (GRC) panels to be attached all the way up the central column. These hang like a curtain and are securely clipped to the main central core to create large interior spaces”, he said. Understanding the behaviour of the structure was a crucial part of the design process, especially considering that when complete, the tower will be on an exposed hill and reach an altitude of 580m above sea level. Wind tunnel testing helped to reach this required level of understanding. This allowed Newtecnic to develop accurately sized facade components from the first stage studies. It also provided the data to optimise the envelope build-up and obtain an accurate understanding of the impact of the facade loads on the behaviour of the concrete structure. According to Watts, the envelope system was designed to minimise installation time and uses an innovative method that integrates thin GRC rainscreen panels, stiffened by a steel frame, which is fixed directly to a backing wall that incorporates integrated glazed openings. Building such a tower on an exposed hill in a region which has a history of seismic activity presents unique design challenges. I asked Kunchev how different combinations of forces acting on the structure are accounted for and simulated. He told me that seismic forces, wind loads and self-weight are all evaluated at the very first stages to determine which force prevails. “Once this is understood, it is applied to all aspects of the design including the detail. The models go up and down the detailed bill of materials and even down as far as determining how the façade seals work,” he explained. He went on to explain that although different considerations are taken into account for the main structure and the facades, both seismic and wind loads are modelled both individually and together to understand the load combinations on the structure. In the case of the KCTV tower, the wind forces outweigh the seismic loads considerably. “Wind prevails in this design and although seismic forces are a factor, they are less relevant in this case,” explained Kunchev. Using innovative design ideas in the construction of extreme buildings has its drawbacks, not least of which is the consequence of catastrophic failure, something which instils a certain level of fear within the construction industry. I asked how what the company’s approach is in order to overcome this constraint. Watts explained that generally, the industry tends to be more intuitive and experience-based than other industries and that there is a fear of failure associated with that. To overcome this, Newtecnic relies more on procedural practices, innovation and the development of its staff to break away from industry traditions. “The fear of failure is reduced through robust prototyping, design validation, testing and verification,” he told me. The company is equipped with laboratories and testing facilities to check material properties and it uses the latest 3D printing technology for producing prototypes to show how the structure fits together and verify the design. Newtecnic is a boutique company employing just 30 people in two offices in London and Cambridge. “Our Cambridge office is linked to academia so that we can go to first principles on challenging problems and include peer reviews with our university partners. It has a completely different rhythm to our more production oriented London office. Having that different rhythm is important so that the production pressures don’t influence the approach taken in the Cambridge office,” explained Watts. The company took the step of creating technical and quality manuals and gaining ISO9001 certification to adopt a consistent, professional and quality assured approach to its work. It also applies best practices and drives innovation by setting reading material for its engineers. “We keep abreast of all that’s happening by devouring everything that’s applicable to the industry,” he told me. Newtecnic decided on the use of Computational Fluid Dynamics (CFD) software for performing simulation tests of its designs in different airflow cases. Using CFD for wind analytics has a high influence over the structural and environmental design to overcome the potential for fatigue or vibration resulting from wind or seismic activity. “The wind produces positive and negative pressures across the surface of the tower in the same way as if the tower were immersed in flowing liquid. By using CFD to simulate this, you can start to understand the behaviour of the tower and the facades so that you can optimise the design and reduce costs with benefits that are typically around 20% for facades,” explained Kunchev. With building regulations often being the benchmark with a resultant tendency to over engineer, the general approach in the industry is to examine worst case and build to withstand it. “Using CFD is more scientific, it’s an accurate tool that shortens development times and helps to optimise the design from the start,” he said. CFD analysis also ensures that numerous design iterations can be quickly assessed and verified. Kunchev went on to explain that the right skills are needed in order to be successful in this. Input values determine the level of accuracy and so the skill lies in providing the correct inputs that accurately define the environment and gaining agreement on any approximations. Once the tower has been constructed, it will need to be maintained with regular inspections and cleaning operations. Unmanned cradles aren’t a viable option as they are unable to carry any parts and it can take a month to do regular checks and cleaning in this way. Using twin-layered cladding with a gantry between them isn’t an option either due to the cost implications. To overcome these challenges, Newtecnic is creating manuals for the design that have the option of taking maintenance to extremes by using drones. Such drones, which are tethered to the building both for safety and for power, will be able to carry out cleaning and inspection tasks much more quickly. The field of building maintenance drones isn’t mature yet but is developing quickly, according to Newtecnic.